The winds of change or just the rot setting in on the UK scene? At the BHPA AGM in March, a proposal from the floor that the Association adopt a new corporate identity more in keeping with its make-up was defeated by a narrow margin. 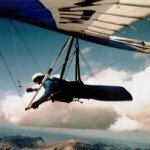 A number of paraglider pilots, unhappy with the precedence of ‘hang gliding’ before ‘paragliding’ in the BHPA’s name, proposed that the Association be renamed the British Paragliding and Hang Gliding Association. A graphic designer among their number had come up with a new Association logo to reflect the change. from both sides, during which one member even claimed that the logo belonged to a Bedfordshire housing association, a vote was taken and the proposal to change the BHPA’s name and logo was defeated. Despite their evident design expertise, supporters of the ‘BPHA’ will have to bow to the democratic principle and lick their wounds … for now. I'm glad no change was made. Don't these collapsible canopy people realize that hang gliding created their organization? I might still be a member of the USHGA if it hadn't given collapsible canopy occupants a place at OUR table. The Brits could also have gone a different way. There's a concept called Respecting Your Elders. In this case the sport of hang gliding is the elder. Thanks for keeping us aware Tony. Technically I believe paragliders are classed by the FAI as a subset of the hang glider definition. Any contemplated name change should consider a wider catchment name such as foot launched gliders. However this homoganised term might not appeal to hang glider pilots or paraglider pilots that seemed to have polarised diametrically opposite. Interestingly the BHPA now includes wheeled aircraft with power units and human powered aircraft under its umbrella. ARP wrote: . . . Interestingly the BHPA now includes wheeled aircraft with power units and human powered aircraft under its umbrella. Human powered aircraft could take any form so a human powered paraglider might be a possibility? Light weight with a large wing area, flying very slowly seems to fit in with the requirements for an HPA. ARP, I could see a human powered PG first launching from a hill and then begin to pedal his/her propeller. I think that might help extend their glide. But every human powered aircraft I've heard of is (yes) light weight, but also has a VERY good LD/glide ratio. Probably in the range of 20-30 to 1 (or higher). PGs can't come anywhere near that. In fact, your typical high performance "delta wing" hang glider can't even cop the necessary glide ratio. But I've seen a video that shows that the Gossamer-Albatross was not the end of human powered flight efforts. There are regular people building working human powered aircraft. I think there are even competitions (for prizes?) going on. None of the wings are PG like. What do you get when you combine a big organization with a little organization? You get the big organization. The little one disappears. wingspan33 wrote: ARP, I could see a human powered PG first launching from a hill and then begin to pedal his/her propeller. I think that might help extend their glide. But every human powered aircraft I've heard of is (yes) light weight, but also has a VERY good LD/glide ratio. Probably in the range of 20-30 to 1 (or higher). PGs can't come anywhere near that.